Trends like autonomous driving make functional safety a key technology in the automotive industry. More and more electronic functions define the driving experience — and they must be safe. It is essential that these safety systems work reliably to ensure human safety, even in the case of a malfunction or an accident. That’s why carmakers relying on AUTOSAR need electronic control unit (ECU) software, developed and integrated in accordance with the ISO 26262 standard and up to the highest Automotive Safety Integrity Level, ASIL D.
ISO 26262 is an adaption of the IEC 61508 functional safety standard and has been specially developed for the safety needs of the automotive industry. It has to be applied in order to meet the legal regulations required for state-of-the-art software development. ISO 26262 defines “Functional Safety” as the absence of unreasonable risk due to hazards caused by malfunctioning behavior of electrical and electronic systems. According to ISO 26262, freedom from interference is a fundamental requirement, i.e. there must be a guarantee that different software components can coexist without disturbing each other. The functional safety standard determines the classifications of the Automotive Safety Integrity Level (ASIL), ranging from the lowest, ASIL A, to the highest, ASIL D. A safety ECU project receives a rating (ASIL A, B, C or D) based on requirements and measures throughout the whole development life cycle. Depending on the safety and ASIL requirements, there are different possible basic software architectures. To determine the right architecture, you need to consider the project requirements with respect to functional safety as well as system performance and maintainability. EB offers consulting for safety architecture workshops, standardized safety products, and services to support you during the project. EB is one of the leading companies addressing functional safety / ISO 26262 in automotive ECUs. 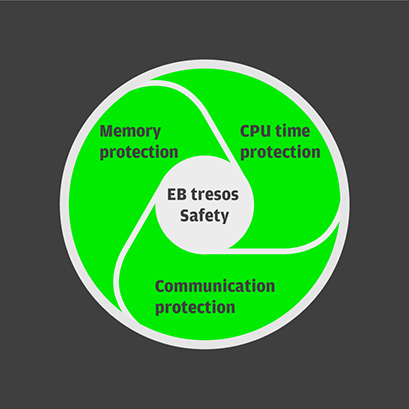 Our EB tresos product line incorporates our extensive safety knowledge and expertise. Our products are developed according to ISO 26262 to enable safe AUTOSAR ECUs. Our AUTOSAR basic software stack is the software base of functional safety. Our configuration and integration tool for basic software and functional safety projects. ASIL software requires a safe execution environment to enable safe ECUs. There is no safety without security, and vice versa. Advanced driver assistance systems (ADAS) require a safe software base according to ISO 26262.